Enter For A Chance To Win Pass To See THE OATH on September 26th at 7:30 PM in SAN FRANCISCO. Writer/Director Ike Barinholtz will be in attendance for a post-screening Q&A. 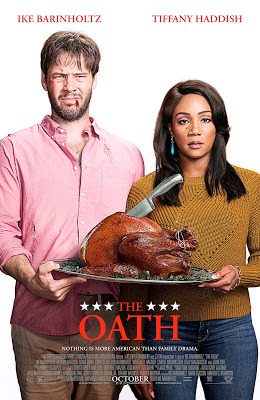 Join us with Sandwichjohns Films for a free screening of the the Oath you know this will be a hillarious funny movie about family Thanksgiving and doesn't want to see Tiffany Haddish she's the so funny have you gut busting laughing. Join the in crowd and sign up with the ultimate SandwichJohns Films for free passes to an advance screening to the Oath. Don't be late it's going to be great!